As I posted in two videos so far and more than a few blog entries, and yes as you can imagine, on my words of a beast page I have a lot more than just 5 quotes regarding all this; but do you recall these Vatican statements wherein they have made very serious plans to make the United States of America into a Roman Catholic country coast to coast so as to both remove religious freedom as well as quench all Biblical truth? "But Constitutions can be changed, and non-Catholic sects may decline to such a point that the political proscription [ban] of them may become feasible and expedient. What protection would they have against a Catholic state?" –The State and the Church, pp.38,39, by Miller and Ryan, imprimatur of Cardinal Hayes. "There is one, and only one, sure democracy, the Catholicism of the Popes" -The Catholic World, Oct, 1937. "Under the influence of Germanic customs and concepts, torture was little used from the 9th to the 12th centuries, but with the revival of Roman law the practice was reestablished in the 12th century… In 1252 (Pope) Innocent IV sanctioned the infliction of torture by the civil authorities upon heretics, and torture came to have a recognized place in the procedure of the inquisitional courts. -New Catholic Encyclopedia, arts. "Inquisition", "Auto-da-Fe'," and "Massacre of St Bartholomew's Day." 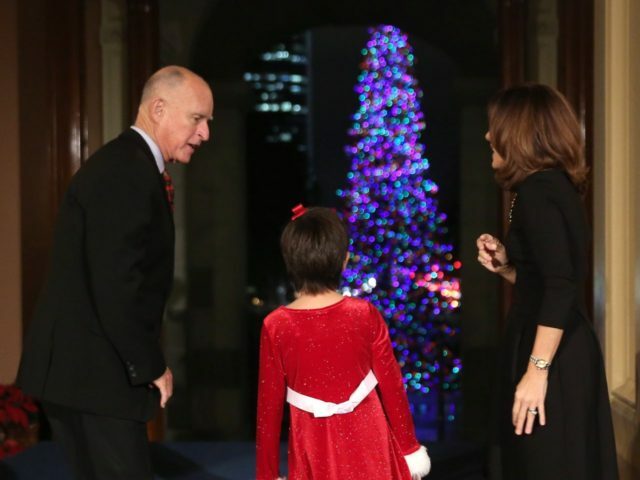 Being in the last days as we are, we now see men like this loyal Roman Catholic Governor Jerry Brown doing all he can for his declared "god on earth" in the Vatican. He is literally defying the laws of the land he was elected to govern just like all his Popes have done ever since the wound started to heal in 1929 so as to assure they get to where prophecy says they will be when Satan stands on earth claiming to be Jesus Christ. Satan needs America as well as every nation on earth to be under the thumb of his man of sin in Rome if this is going to work and so Senators, Congressmen and Governors like Brown will do whatever it takes for their dying God to gain the power he so craves; despite the fact it's as fleeting and short lived as the lies he spews. In short, these Catholic men in power don't care if those coming into this country are dangerous and this is why once here they will go so far as to pardon hardened criminals who place everyone's lives in mortal danger just to keep the Pope's immigration agenda well-guarded and defended. Soon even more innocent lives will be lost so as to assure the voting bloc of Rome continues to grow. Need I remind you of Kate Steinle and how an illegal immigrant deported multiple times was still allowed to roam freely in America so as to kill her? In fact, if you just put the words "illegal alien killed" in your favorite search engine you will be shocked at how many times this has happened in just the last few years alone. But none of this matters for the Pope or those Roman Catholic politicians that worship the Pope they declare to be "another god on earth" just as prophecy said they would. I was told that we are all in the book of life from the being!!! If so why do we still need to repent?? Can you open mine mind on this subject?? In other words.. EVERYONE needs to accept Jesus as Saviour in order to remain in the book of life because the only way to be able to “overcome” and “clothed in white raiment” is to allow Jesus to guide our walk. Since Jesus Christ died for everyone on this planet, everyone's name was put into the Book of Life, we all start out "saved". If we accept Jesus Christ, our names remain; if we refuse, our names are removed. It's God's gift, but we need to accept His gift. Names are not added, they're rubbed out. Like being hired for a job but refusing to do what the boss says – out you go, while the loyal employees get to keep their jobs. It's conditional. Very sad for God to have to remove people's names from His Book of Life.